Prominent & Leading Manufacturer from Pune, we offer wallputty plant and wallputty manufacturing plant. Wallputty is amongst the most versatile material used in modern construction industry. It serves to lay bricks & other masonry blocks, coat building as renders & skim coat & fix tiles. Now a days all Indian & Foreign construction Industries are demanding for new improved building material. The modern Wallputty are produced in a special factory with dedicated facilities on batching & blending of all the necessary ingredients in highly-controlled process. In this way, different types of Wallputty products with well-defined properties & performance to meet specific requirement and application can be produced. 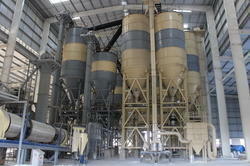 We are a renowned and customer centric firm, which is engaged in delivering a comprehensive range of Wallputty Plant. Looking for Wallputty Plant ?